Earlier today we posted a trailer for the film adaptation of London Boulevard by Ken Bruen. 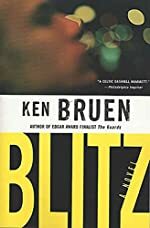 Now we've found (via /Film) a new international trailer for another Bruen thriller, the film adaptation of Blitz, the fourth novel in the Tom Brant series. Jason Statham plays Detective Sergrant Brant in the film, which is expected to be released sometime during 2011. Published in 2002, Blitz follows the South East London police squad as they track a serial killer. Nicknamed "The Blitz" by the rabid London media, the killer is aiming for tabloid immortality by killing cops in different beats around the city.